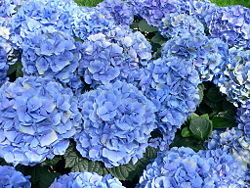 The Hydrangea macrophylla blossoms in pink or blue, depending on soil pH. In acidic soils, the flowers are blue; in alkaline soils, the flowers are pink. pH is a measure of the acidity and the basicity/alkalinity of a solution in terms of activity of hydrogen (H+) (strictly speaking, there is no such thing as the H+ ion; it is H3O+, called the hydroxonium ion). For dilute solutions, however, it is convenient to substitute the activity of the hydrogen ions with the concentration or molarity (mol/L) of the hydrogen ions (however, this is not necessarily accurate at higher concentrations). In aqueous systems, the hydrogen ion activity is dictated by the dissociation constant of water (Kw = 1.011 × 10−14 M2 at 25°C) and interactions with other ions in solution. Due to this dissociation constant, a neutral solution (hydrogen ion activity equals hydroxide ion activity) has a pH of approximately 7. Aqueous solutions with pH values lower than 7 are considered acidic, while pH values higher than 7 are considered basic. The concept of pH was introduced by S.P.L. Sørensen in 1909, and some sources trace it to the Latin term pondus hydrogenii. Other sources, however, attribute the name to the French term pouvoir hydrogène or puissance d'hydrogène. Though pH is generally expressed without units, it is not an arbitrary scale; the number arises from a definition based on the activity of hydrogen ions in the solution. The pH scale is a reverse logarithmic representation of relative hydrogen ion (H+) concentration. On this scale, an upward shift by one integral number represents a ten-fold decrease in value. For example, a shift in pH from 2 to 3 represents a 10-fold decrease in H+ concentration, and a shift from 2 to 4 represents a 100-fold (10 × 10-fold) decrease in H+ concentration. aH+ denotes the activity of H+ ions, and is dimensionless. In solutions that contain other ions, activity and concentration are not the same. The activity is an effective concentration of hydrogen ions, rather than the true concentration; it accounts for the fact that other ions surrounding the hydrogen ions will shield them and affect their ability to participate in chemical reactions. These other ions effectively change the hydrogen ion concentration in any process that involves H+. A solution of pH = 8.2 will have an [H+] concentration of 10−8.2 mol/L, or about 6.31 × 10−9 mol/L. Thus, its hydrogen activity aH+ is around 6.31 × 10−9. A solution with an [H+] concentration of 4.5 × 10−4 mol/L will have a pH value of 3.35. In solution at 25°C, a pH of 7 indicates neutrality (i.e., the pH of pure water) because water naturally dissociates into H+ and OH− ions with equal concentrations of 1×10−7 mol/L. A lower pH value (for example pH 3) indicates increasing strength of acidity, and a higher pH value (for example pH 11) indicates increasing strength of basicity. Note, however, that pure water, when exposed to the atmosphere, will take in carbon dioxide, some of which reacts with water to form carbonic acid and H+, thereby lowering the pH to about 5.7. Neutral pH at 25°C is not exactly 7. pH is an experimental value, so it has an associated error. Since the dissociation constant of water is (1.011 ± 0.005) × 10−14, the pH of water at 25°C would be 6.998 ± 0.001. The value is consistent, however, with neutral pH being 7.00 to two significant figures, which is near enough for most people to assume that it is exactly 7. The pH of water gets smaller with higher temperatures. For example, at 50°C, the pH of water is 6.55 ± 0.01. This means that a diluted solution is neutral at 50°C when its pH is around 6.55 and that a pH of 7.00 is basic. Most substances have a pH in the range 0 to 14, although extremely acidic or extremely basic substances may have pH less than 0 or greater than 14. An example is acid mine runoff, with a pH = –3.6. Note that this does not translate to a molar concentration of 3981 M.
The "pH" of any other substance may also be found (e.g., the potential of silver ions, or pAg+) by deriving a similar equation using the same process. These other equations for potentials will not be the same, however, as the number of moles of electrons transferred (n) will differ for the different reactions. Values of pH for weak and strong acids can be approximated using certain assumptions. When calculating the pH of a weak acid, it is usually assumed that the water does not provide any hydrogen ions. This simplifies the calculation, and the concentration provided by water, ×10−7 mol/L, is usually insignificant. Solving this for x yields 3.9×10−3, which is the concentration of hydrogen ions after dissociation. Therefore the pH is −log(3.9×10−3), or about 2.4. By using a pH meter together with pH-selective electrodes (pH glass electrode, hydrogen electrode, quinhydrone electrode, ion sensitive field effect transistor and others). As the pH scale is logarithmic, it doesn't start at zero. Thus the most acidic of liquids encountered can have a pH of as low as −5. The most alkaline typically has a pH of 14.
where Kw is the ionization constant of water. This formula is valid exactly for temperature = 298.15 K (25°C) only, but is acceptable for most lab calculations. An indicator is used to measure the pH of a substance. Common indicators are litmus paper, phenolphthalein, methyl orange, phenol red, bromothymol blue, and bromocresol purple. To demonstrate the principle with common household materials, red cabbage, which contains the dye anthocyanin, is used. ↑ http://www.jp.horiba.com/story_e/ph/ph01_03.htm. Retrieved December 14, 2007. ↑ http://chem.lapeer.org/Chem2Docs/pHFacts.html. Retrieved December 14, 2007. ↑ http://www.madsci.org/posts/archives/sep2001/1000136604.Sh.r.html. Retrieved December 14, 2007. ↑ Davis, R. E.; Metcalfe, H. C.; Williams, J. E.; Castka, J. F. et al. 2002. Aqueous Solutions and the Concept of pH. In Modern Chemistry, p. 485. Austin: Holt, Rinehart and Winston. ↑ http://encarta.msn.com/encyclopedia_761552883/pH.html. Retrieved December 14, 2007. ↑ http://bcn.boulder.co.us/basin/data/COBWQ/info/pH.html. Retrieved December 14, 2007. ↑ chemistry.about.com. Retrieved December 14, 2007. CurTiPot pH calculation + virtual titration + acid-base titration curve data analysis + distribution diagram generation + pKa database. This page was last modified on 9 January 2019, at 17:36.